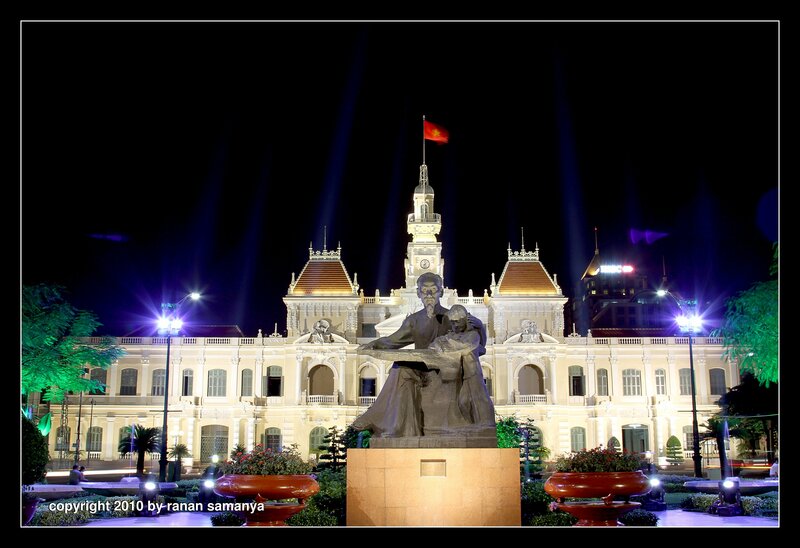 Bac Ho statue in front of Saigon City Hall. When we decided to go to Viet Nam, it has never occurred to me that I will become so amazed with Ho Chi Minh. From Saigon (aka Ho Chi Minh City) to Ha Noi, we can see his figure all over the country: as a statue, on political party posters and banners, on each Vietnamese currency note, and in stories people tell. “The object of my relationship with Vietnam has been to heal the wounds that exist, particularly among our veterans, and to move forward with a positive relationship…“. I had to compare him with our Indonesian great leaders: Soekarno and Soeharto. And witnessing the development and achievement Viet Nam has today, I would say that he is an even greater leader than ours. So here is the first of a few tidbits from a rush 12 days visit to the country of the Great Land beyond the South. I just had to upload a higher than my usual resolution to enable us to see the details of statue and the City Hall. Using f/8.0 was enough to show this (but now I wish I have used f/22!). Lucky the area was brightly lit, but nevertheless I used a tripod for the 2 second shutter. Electronic level was also used together with LiveView with exposure simulation on. It took me quite a few frames before I was satisfied with the Viet Nam flag on top of the City Hall. Tergantung sumber cahayanya. Yang di Esplanade itu kan kalian foto di kegelapan, jadi diafragmanya musti gede pake ISO 400.